Very few companies have embraced the enthusiast community like Epox has these last few years. They were the first to offer "insane" voltages for end users, and their boards are always among the best in the market in both performance and overclockability. Team that up with nVIDIA's new nForce3-250 chipset and you have yourself a combination that simply cannot be beaten! I suspect there will be quite a few enthusiasts jumping over to the AMD camp in the next little while, especially now that the nForce3-250 has been released. One of the biggest turn offs from that platform has been fixed, and if our results are any indication, nForce3-250 has a ton of headroom. The Epox 8KDA3+ is a very well rounded motherboard with a ton of features which include an additional Serial ATA RAID controller, Gigabit LAN and 7.1 audio! 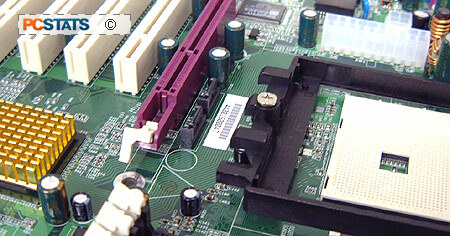 Furthermore, the six PCI slots should give you ample room for expansion. There is however, no onboad Firewire here, so if that is something you use, you'll need to get a PCI IEEE1394 card. My only complaint about the layout is the placement of Serial ATA channel one and two. Being just above the AGP slot means that the Serial ATA cables may interfere with after market videocard coolers, and even if they don't, they are just simply hard to reach. It's weird, but all the NF3-250 motherboards we've tested have had two serial ATA channels in that same location. As the benchmarks indicated, of the Epox 8KDA3+ was excellent. At stock speeds it performs on par with other nForce3-250 motherboards, and when its overclocked it totally killed the competition! Our particular board reached an amazing 290 MHz motherboard clock speed. I suspect that better Northbridge cooling may have allowed it to go even further... On that note I hope that future revisions of the 8KDA3+ have mounting holes around the NF3-250 chipset, it gets quite toasty during operation! 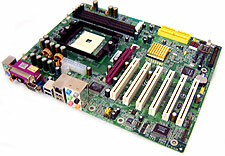 If you're looking for a wicked fast AMD Athlon64 motherboard look no further than the Epox 8KDA3+!